THE SECOND JERUSALEM BIENNALE FOR CONTEMPORARY JEWISH ART WILL SHOWCASE THE WORK OF NEARLY 200 ISRAELI AND INTERNATIONAL ARTISTS. Participating artists: Helène Aylon, Siona Benjamin, Tobi Kahn, Rachel Kanter, Robert Kirschbaum, Richard McBee, Archie Rand, Cynthia Beth Rubin, Joel Silverstein, Eli Valley, Yona Verwer, David Wander, and Ahron Weiner. There are 3 events in conjunction with this exhibit: the opening reception September 24, a panel discussion/film screening September 30, and a symposium November 1. Polonsky Academy at the Van Leer Institute, 43 Jabotinsky Street, next to the Presidents House. See a map of the venues here. Jewish art in the United States today exists as its own defined and developed field of visual art. In 2013, the art historian Matthew Baigell described our era as “the Golden Age” of American Jewish art. These artists present complex, critical and questioning observations, that draw on deep knowledge and reinterpretations of the Jewish texts. The exhibition New York/New Work presents, for the first time in Israel, some of the current major and canonical artists of contemporary Jewish art in the United States. These artists hail from different diasporic spaces and appropriate Jewish traditions on their own terms. Their contributions to the development of contemporary American Judaism in the context of a dual diasporic lens are considerable: on the one hand, they examine the Diaspora’s relationship with itself; and, on the other hand, they look at its relationship with other diasporic locations. Contemporary scholars explain the concept of “Diaspora” as a synchronous culture where people are located within two cultures and two languages: they share the culture of where they live, but they also belong to the culture of another group. This complex condition suggests simultaneous local and trans-local cultural belonging and expression. In other words, it is a condition where the collective has two compasses: one points to the person’s physical location, while the second points to another, distant locale; one to the local culture, and the second to the culture the person shares with other, related collectives that live elsewhere. “What makes Judaism a diasporic culture,” scholar Daniel Boyarin stresses, “are the ties with other Jews in other places around the world, thanks to Judaism’s cultural discourse and practice. . . .” Boyarin points to the study of texts as the central axis of the Jewish diasporic condition. Many of the works on display in this exhibition are inspired by the Bible, midrash (textual interpretations or explanations) and Jewish myth, but seek to speak to the here and now through various discursive contexts: ethnicity, religion, politics and gender. Other works draw on traditional Judaica and are an act of reinventing the text and the ritual, shaping these in a conceptual or spiritual language. Although the artists working within this framework do not reject aspects of secular Jewish culture, they undoubtedly place religious values at the center of the discussion on Jewish culture. One of the characteristics of the new trend, namely a direct and in-depth focus on Judaism, is the establishment of groups and associations of artists who draw their inspiration from Judaism in all its diversity. The current exhibition presents new works by members of the JAS (Jewish Art Salon), one of the most important, and certainly the largest, of such groups. Archie Rand explores the cycles of traditional Judaism in his art. He has created a number of series, including ones that look at the seven days of creation, the 613 mitzvot (commandments), the 39 activities prohibited on the Sabbath, the Amidah prayer (central prayer of Jewish liturgy) and the 54 weekly Torah portions read in the synagogue. The current exhibition presents a new series by Rand that examines the four mitzvot of Purim: reading Megillat Esther, the festive meal, mishloach manot (gifts of food to friends) and matanot leevyonim (gifts to the poor). Helène Aylon previously exhibited an ambitious and radical installation, The Liberation of G-d, (1990–1996) that launched her long-standing preoccupation with a radical feminist critique of the Jewish world, institutions, worship and canonical texts. In The Liberation of G-d Aylon marked the non-humanistic verses found in the Torah. In the work she is exhibiting here, she marks the Torah verses brimming with anger and brutal curses and questions whether these verses can be indeed be attributed to G-d.
A feminist perspective also emerges in the works of Rachel Kanter, a textile artist who creates feminist ritual textiles, and of Tobi Kahn, whose work over the years has reinvented traditional ritual objects. Here Kanter is exhibiting a giant mezuzah that transforms the traditional mezuzah into a feminist “Femage”—a collage incorporating elements of women’s traditional crafts in a way that combines both solidarity and criticism. Kahn’s “Judaica” is characterized by a contemporary, abstract and conceptual language that always touches on spirituality. The four small chairs in the current exhibition symbolize the four mothers of the Jewish people. The chairs serve as models for new ritual objects. Just as the traditional “Chair of Elijah” is used during the circumcision ceremony, these chairs are intended to be used during the “zeved habat” ceremony when a baby girl is named. New designs for traditional Jewish objects also appear in the works of Robert Kirschbaum, connecting a clean design language with the spirituality and mysticism that is found in the Holy Scriptures. His series, entitled Devarim, is composed of 42 sculptures, the same number as the number of letters in the ineffable Divine Name. The series connects the material with the spiritual, and what is missing with the utopian. The sculptures derive their forms from Hebrew letters, architectural models in Jewish sources and ritual objects. One work in the exhibition refers to the letter “Tav” and to the shape of the Temple as described in the prophecy of Ezekiel; another’s shape is inspired by the steps used to light the menorah in the Temple and a third recalls the shape of tefillin (phylacteries). Although Jewish diasporic culture is articulated in the works of all the artists in this exhibition, it is particularly clearly expressed in the works of Siona Benjamin, a Jew born in India, who connects Indian iconography, American pop culture and Judaism. The complex relationship between the Diasporas, i.e., American Jewry and Israel, are strongly present in the comics of Eli Valley. On the other hand, the particularistic history of American Jewry is addressed in the works of Yona Verwer and Cynthia Beth Rubin, who employ the new technology of Augmented Reality to add layers of meaning and association to their imagery. The texts and myths that connect the different Jewish Diasporas create a connection between the past and the present in the works of Richard McBee and David Wander. McBee’s works draw their inspiration from the Bible and midrash, to which he offers psychological and existential interpretations. The political context of his works, which address the biblical stories of Hagar and Ishmael, are reinforced in the current Israeli exhibition. Wander’s work in the exhibition looks at Samson, the biblical hero, and is part of a broader series of visual midrash. The connection or confrontation between biblical myths and current culture is clearly expressed in the art of Ahron D. Weiner, whose work deliberately reveals the holy encoded within the secular. Through the medium of décollage using advertisement posters, he creates high culture (art) from what is considered low culture (advertising). Joel Silverstein achieves a similar effect in a different way, by hybridizing the legends that sprung from American Jewry—Superman and The Incredible Hulk—with traditional Jewish myths, like the Golem of Prague and the Messiah. Israeli culture has no defined or well-developed field of Jewish art; Judaism—as a living and unique religious tradition—is usually excluded from the central discourse of Israeli art. Viewing the “there” from within the prism of the “here,” through an art exhibition that draws its inspiration from Jewish tradition, sources and culture, can challenge the conventional dichotomy in Israel that separates art from religion, and Jewish art from Israeli art. Unraveling these dichotomies and subverting the resulting hierarchies can inspire the local art scene that alienates itself from tradition. Polonsky Auditorium, Van Leer Institute, Jerusalem, 43 Jabotinsky Street. 16:30 – With exhibiting artists Yona Verwer, Richard McBee, Siona Benjamin, Cynthia Beth Rubin, David Wander. Moderated by Dvora Liss and David Sperber. Director: Hal Rifkin (28min, USA/India, 2015) English. Documentary. An exploration of artist Siona Benjamin’s fascinating life and work. A Jew raised in India, Benjamin goes on to achieve global acclaim for her vibrant paintings, which blend Talmudic, Hindu and Islamic references with contemporary Western art influences. Conversation with Siona Benjamin follows the screening. Filmmaker: Kelly Spivey (25 min, USA 2015) English. Sound Mix: Alex Noyes. The Liberation of Helène Aylon is a film portrait that explores how a Jewish Orthodox woman became a contemporary feminist artist. Polonsky Academy Auditorium, Van Leer Institute, 43 Jabotinsky Street. 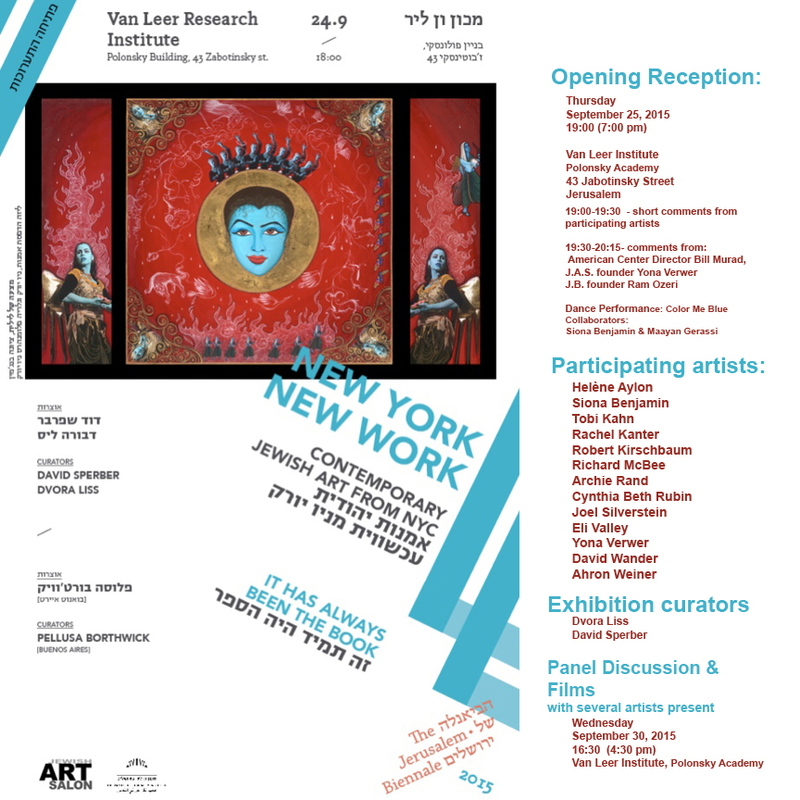 The symposium marks the closing of the exhibition New York/New Work: Contemporary Jewish Art in NYC. “Ima Iylaa; The Art of Motherhood“. With JAS members: Dorit Jordan Dotan, Ruth Schreiber, Ken Goldman, Joan Roth, Doni Silver Simons, Judith Margolis, Yehudis Barmatz, Ma’ayan, Gidon Levin. Venue: The Hechal Shlomo Museum, King George Street. Opening Reception September 30, time TBA. “Women of the Book: Jewish Women Recording, Reflecting, Revisioning,” with JAS members Siona Benjamin, Ruth Weisberg, Judith Margolis, Andi Arnovitz, Ellen Holtzblatt. Venue: The First Train Station, (Tachana), David Remez Street. Opening Reception September 29, 20:30. Do not miss the main event: JERUSALEM.PASSAGES consists of five large scale projects by five leading artists. The projects, chosen by the Advisory Committee of Biennale2015, will be presented in the Tower of David Museum. Participating Artists: Sigalit Landau, Motti Mizrachi, Ynin Shillo, Pablo Lobato (Brazil) and Dov Abramson. Two exhibitions showcase the work of artists from New York (Jewish Art Salon) and Los Angeles (the Jewish Artists Initiative of Southern California which will also host three exhibitions in LA in conjunction with Biennale2015, representing the first time the Jerusalem Biennale extends its reach overseas.) In addition, there will be an exhibition from Buenos Aires, and another from Barcelona. Six exhibitions are from Jerusalem-based groups and/or curators, including well-known Israeli artists such as, among others, Sigalit Landau, Motti Mizrahi, Dov Abramson, Maya Zack and Ynin Shillo exhibiting alongside Israeli-Anglo artists such as Andi Arnovitz, Ken Goldman and Ruth Schreiber. Biennale2015 will host the inaugural exhibition of a nine-year project, Women of the Book and the inaugural installation and performance Present=Presence by Canadian-Israeli artist Alana Ruben-Free in collaboration with Israeli artist David Gerstein. There is also a special tribute exhibition by Bezalel artists in memory of the late Zelig Segal. Jerusalem Biennale Founder Rami Ozeri: “The Jerusalem Biennale for Contemporary Jewish Art provides a stage for professional artists who refer in their artwork to Jewish thought, spirit, tradition or experience. The first Jerusalem Biennale in 2013 created an exciting buzz in the contemporary Jewish art world and, as a result, we were inundated with submissions of the highest quality from Israel and around the world. The Jerusalem Biennale 2015 will further expand the debate on what is contemporary Jewish art and we are thrilled that, once again, this is taking place in Jerusalem, the spiritual and creative center of the Jewish world”. Achim Hasid center, 47 Emek Refai’m St. In this eight photograph series, Israeli video artist Sigalit Landau in a collaboration with photographer Yotam From, tracks the gradual change of a black dress, immersed in the Dead Sea, as it slowly becomes encrusted with salt crystals. The dress is a copy of the iconic dress worn by Lea, the main character in “Hadibbuk”, played for more than four decades by legendary Israeli actress Hanna Rovina. In this installation, Israeli artist Motti Mizrahi has created a 5 meter-high white dress that will hover four feet above ground, with several of the artist’s statues installed around it. On the last day of the Biennale, the dress will be set free to drift upwards into the sky over the Old City of Jerusalem. In these seven video art works and one site-specific sound installation, Israeli-Dutch artist Ynin Shillo explores changing seasons and the changes of light in the Mount of Olives Cemetery. By returning to the same frames time and again, Shillo captures the mountain’s human events, as actors entering the stage; the Hasidic consciousness of God is so strong, that they look as actors who feel that they are being watched. Kav 70 (“Line 70”) divides Jerusalem into 70 equal-sized cells, and explores linear forms and space in each of those cells, comprising a new and conceptual map of the city. Jewish tradition holds that Jerusalem has seventy names – all can be found in the words of ancient Jewish scripture and in the majestic teachings of the prophets. An unconventional journey through Jerusalem that walks the lines that connect – and divide. Brazilian video artist Pablo Lobato has created a new video work specially for Biennale 2015. The work stems from an essay of 21 photographs of Israeli soldiers at rest. The uniformed bodies listen, in silence. The title, Distracted We Will Win, is also the title of a book by Brazilian poet Paulo Leminski. With this book, Leminski shows us a confidence in the body, beyond consciousness. The photographs were taken during Lobato’s May 2015 visit to Jerusalem. This exhibition features works by members of the Jewish Art Salon, a New York-based community of artists and scholars who are slowly transforming their New York Diaspora with a steady infusion of Jewish identity in artwork. Participating artists include Archie Rand, Helene Aylon, Siona Benjamin, Richard McBee, Tobi Kahn, Eli Valley, Joel Silverstein, Robert Kirschbaum, Rachel Kanter, Cynthia Beth Rubin, Yona Verwer, David Wander and Ahron Weiner. Curators: David Sperber and Dvora Liss. The exhibition It Has Always Been The Book includes the works of 22 Jewish and non-Jewish Argentinean artists, referring to the 22 letters of the Hebrew Alphabet. The main medium of the exhibition is artists books, accompanied by related video art. The exhibition circles around the transition from books to digital media, from paper to screen and from ink and paint to pixels. Participants: Grupo Escombros, Teresa Volco, León Ferrari, Delia Cancela, Eduardo Antonio Vigo, Mercedes Estéves, Mónica Goldstein, Teresa Puppo, Leandro Katz, Maiaugusta Vintimilla, Matilde Marín, Susi Sielsky Cantarino, Margarita Paksa, Juan Carlos Romero and Carlos Espartaco. 7,767 mi® is an exhibition that explores connections that bind Jerusalem and Los Angeles by the members of the LA-based Jewish Artists Initiative (JAI), even though the two cities are separated by 7,567 miles. Three additional exhibitions will be mounted at the American Jewish University, Hebrew Union College and USC Hillel in Los Angeles at the same time as the Jerusalem Biennale, with video links enhancing the connection. Participating artists Melinda Smith Altshuler, Bill Aron, Pat Berger, Isaac Brynjegard-Bialik, Ellen Cantor, Sam Erenberg, Carol Es, Benny Ferdman, Karen Frimkess Wolff, Susan Gesundheit, Carol Goldmark, Gilah Yelin Hirsch, Nancy Goodman Lawrence, Laurel Paley, Avi Roth, Doni Silver Simons, Hillel Smith, Debra Sokolow, Ruth Weisberg, Cathy Weiss and Jana Zimmer. Curators: Georgia Freedman-Harvey and Anne Hromadka. A group exhibition entitled A Fine Line with works by artists Heddy Abramowitz, Andi Arnovitz, Yoel Gilinsky, Nechama Golan, Ken Goldman, Ruth Kestenbaum Ben-Dov, Shimon Low, Judith Margolis, Lilach Schrag and Ruth Schreiber exploring the fragile paradigm of those things which define and separate, the public from the private, the real from the imagined. Curator: Susan Nashman Fraiman. “How does the Kabbalistic concept of Mother (Ima Iyla’a) find expression in our world through human wisdom, empathy, and nurturing?” This and other existential questions are posed in a multi-disciplinary exhibit on motherhood by internationally acclaimed artists such as Joan Roth, Maya Zack, Joy Rose, David Gerstein, and others, leading to new interpretations of the real and the ideal of the maternal in the postmodern age of Jewish Art. On September 30th, American-Israeli theater artist Alana Ruben Free, in a collaboration with Israeli artist David Gerstein who created the sculptural set, will premiere Presence=Present’, and then invite her audience to participate in this immersive performance art experience. The exhibit aims to enliven the conversation on art and motherhood as well as point to the yearning, pain, loss and inner connection that mark all mother-child relationships. Curator Nurit Sirkis Bank. A contemporary visual interpretation of the obscure phenomena associated with the windows in the Temple built by King Solomon, [Kings I 6:4: “And he made for the house transparent-opaque\sealed windows”. Transparent and opaque are two opposites existing in one object and, similar to the commentators that tried to find meaning in the phrase, so the artists seek their personal interpretation of the opaque/transparent phenomenon. Artists include Aldana Kac, Chana Cromer, Debbie Kampel, Elisa Pritzker, Esther Schneider, Hiyuli Lieberman, Carolina Bonfils, Lucas Jalowsky, Martina Grounauer, Moishe Kampin, Nachama Golan, Nir Artzi, Noa Sauer, Pesi Komar, Yifat Steinmetz Hirst, Eliran Jan, Shimon Pinto and Maya Zack. Curator Avital Naor-Wexler. 30 artists, most of them teachers of the Bezalel School of Art Design Department and including Sari Srulovitch and Israel Dahan, challenge the borders between Contemporary Art and Judaica. Amulets and wedding rings, cactus-shaped Shabbat candlesticks, a Hanukkah lamp in the Altneuland style and more- all celebrate Jewish ideas in a contemporary context. The exhibition includes a special tribute exhibition in memory of Zelig Segal, a contemporary Jewish art pioneer who passed away this year. Curators: Ido Noy and Dr. Shirat-Miriam Shamir. The Jerusalem Biennale is supported by the Leichtag Foundation (San Diego), the Pershing Square Foundation (NY), the Jerusalem Municipality, the Jerusalem Foundation, PAIS, Bank Hapoalim, the Tower of David Museum, the Ministry of Foreign Affairs and private donors.